Chapter 4 – What’s in the air? I had previously read in class the story and poem on ‘What’s in the air?’ Students had done the picture-based activity, ‘Air is made of different kinds of gases’, in which they counted ‘molecules’ in an imaginary box of air to learn that nitrogen is the most abundant gas in air, followed by oxygen and then carbon dioxide, water vapour and other gases. 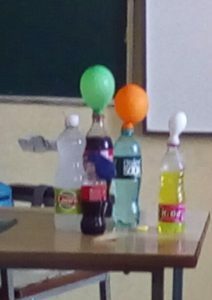 For the next class I asked 6-7 students to bring from home bottles of soda or other aerated / fizzy drinks, and some to bring balloons. They got several bottles of Coca Cola, one Bisleri soda, one Limca and one Dew. The excitement began right here. As soon as the class started students simply could not contain their curiosity and kept urging me to begin with the activity at once. The first bottle I opened happened to be Coca Cola. I unscrewed the top, quickly put a balloon over the mouth of the bottle and, before anyone knew what was happening, the balloon burst with a loud bang! The class spontaneously burst out laughing and clapping. I immediately picked up a second balloon and fixed it over the top. It blew up a little. Then I shook the bottle and the balloon blew up some more. 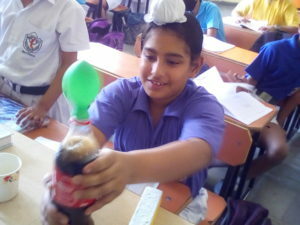 Some of the Coke also splashed up into the balloon. This spurred more curiosity amongst students and they started flooding me with questions. 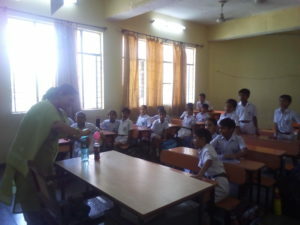 Two of the students rushed up and asked for the Bisleri soda bottle. As they ran back to their desk they must have shaken the bottle quite a bit because when they unscrewed the top the soda spurted out like a fountain, splashing on to their desk. They missed the thrill of balloon burst, as by the time they managed to put the balloon on, most of the gas had escaped. All this caused more excitement in the class and all the students wanted to try out the activity. I took some time to explain that aerated drinks contain carbon-dioxide which is dissolved into them under pressure. 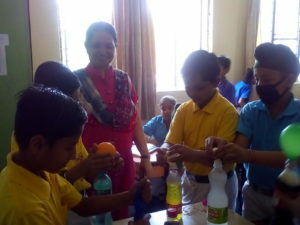 Then I distributed 6 bottles and balloons amongst six groups comprising of 5 or more students each. One new inference that came up through all the trials was that all the aerated drinks may have different amounts of pressurized gas in them. By now students were super excited and charged, and bombarded me with their questions. • Will the gas-filled balloon fly (float up)? I took the balloon off the Coke bottle, tied its mouth and left it in the air. The balloon immediately fell to the ground. 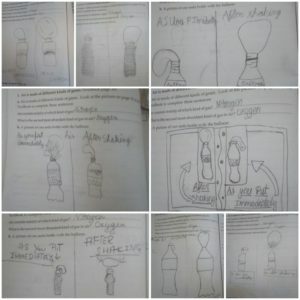 • Will the balloon fly if it is removed immediately from the bottle after filling with gas? • Being heavier would have made the balloon drop. • There was vapour in it. • Is it possible to refill the gas from the balloon back into the bottle? We could apply pressure to do it. 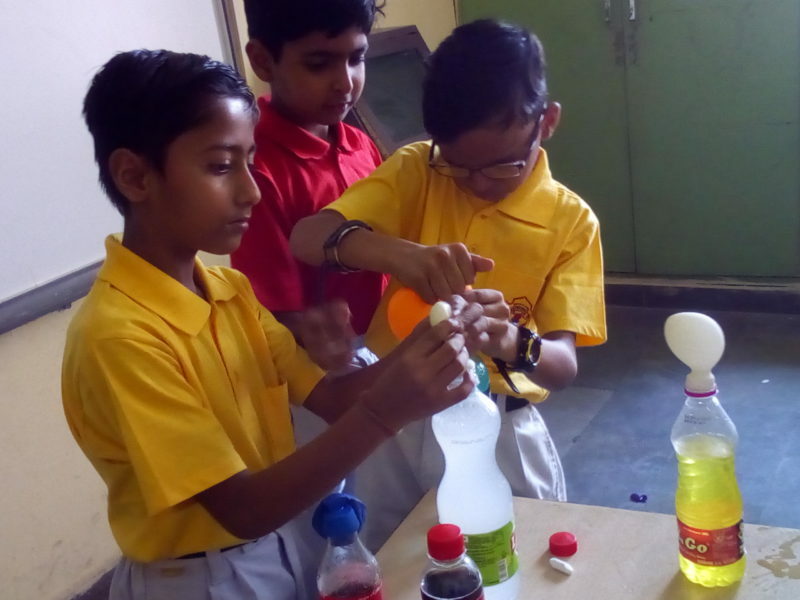 Three students volunteered to performed this activity and concluded, it is not possible to manually pressurise the gas back into the drink. • Is it possible to keep blowing up the balloon by continually shaking the bottle? At this point everyone noticed that the balloons which had blown up were slowly getting deflated. They guessed that gas may be escaping around the edges if they were not tightly sealed. 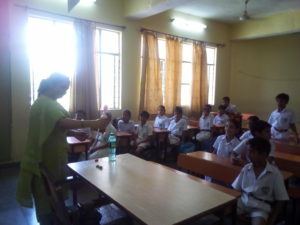 Till now Ms. Jayashree had been observing the activity and listening to the discussions among the students. Now she asked, the balloon that fell down was filled with carbon dioxide, perhaps also some water vapour from the bubbles may have got in? The students agreed. We could check if the inside of the balloon was wet. Another question, when you inflate a balloon by just blowing into it, does it fly? Students were a bit confused, but remembered that after a while the balloon does go down. Party balloons are different, though. Sometimes you found them stuck on to the ceiling. What could be inside these balloons? Now there was a discussion: when we blow into a balloon what is the composition of air that gets filled in it? One student said, it must be normal air. Another thought for a while and said, it must be carbon dioxide — we breathe in oxygen and breathe out carbon dioxide. That brought up another question, out of all the gases in the air around us, does only oxygen go in through our nose? That can’t be! We must be taking in all the gases in the air. So maybe only the oxygen gets used up? Then what is the composition of the air that we breathe out? Does it have no oxygen in it? What about the party balloons that floated up? What was the gas used by balloon vendors we saw in the market? One student remarked that it might be helium. Another said the gas smelt bad, and several others agreed. This discussion was incomplete so I gave them as an assignment to ask their parents or others to check what was the gas filled by the balloon vendors. I had planned the activity for one period but due to active participation and inquisitiveness of the class it extended to two periods. 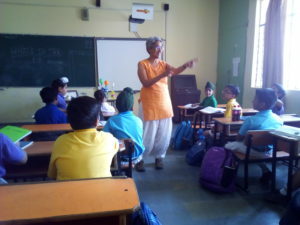 The next day, the moment I entered the class students were exuberant to give me the answer for the homework I had given them the previous day. They had found out that the balloon vendors filled their balloons with hydrogen, which is much lighter than normal air. About the smell, we still don’t know. Hydrogen is far cheaper than helium but it may be dangerous if the balloon bursts near some inflammable material. It is more dangerous for the balloon vendors who prepare and handle the gas without any safeguards. I later found videos of how street vendors produce hydrogen for balloons. I also learnt that the Kerala Fire and Rescue Services Department was thinking to put restrictions on the sale of hydrogen balloons during festivals. Small Science continues to be an enjoyable learning experience for us all.